The ACP confirmed RUSA's status as a Correspondant direct in the following FAXes. In order to reduce the number of direct correspondents in the US, the Correspondant direct status of BMB and that of the Bluegrass Cycling Club have been combined and transferred to RUSA. I received your FAX with the detailed information. The ACP's Comité Directeur will have a meeting tomorrow. Your proposal and the points dealt with therein, will be approved, and the Correspondant direct status of BMB and the Bluegrass Cycling Club will be transferred to RUSA. 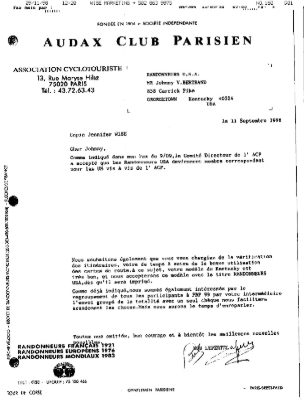 September 11, 1998 FAX (40+ KB)! 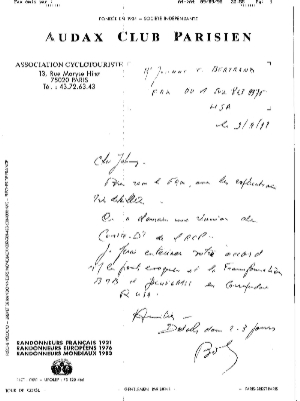 As indicated in my FAX of 9/9, the ACP Comité Directeur voted to accept Randonneurs USA as an ACP corresponding member for the US.